In many cases, it’s forcing them to cut workers’ hours and buy less from suppliers — measures that could ripple through the larger U.S. economy. In the nation’s capital, Clyde’s Restaurant Group, which owns the Old Ebbitt Grill restaurant down the street from the White House and 10 other dining spots, reported a 20 percent drop in sales and is cutting hours for waiters and kitchen staff. “For my business personally it’s been absolutely devastating,” said Hanna Wackerman, co-owner of the 1850 Restaurant and Brewing Company. “Usually January is a pretty busy month for us. With the new snow being in Yosemite, that tends to bring new tourists to the park.” Instead, business is down 80 percent, she said. Most of the purchases are discretionary and customized. For example, if a BLM employee is retiring, co-workers might order a plaque from Lynch’s company. His online orders went from thousands of dollars a week before Christmas to just $78 in the first week of January. On Jan. 7, Lynch laid off nearly everyone, leaving one person to answer the phone “in case someone wants to buy something.” They were the first job cuts in the company’s 43-year history. With business so slow, Lynch isn’t ordering any of the bronze, silver or pewter he uses and isn’t replenishing other inventory. Larger companies are also affected, though it is typically easier for them to weather the impact. Airlines like Delta and Southwest, for example, are losing tens of millions of dollars in business, but that’s out of billions in revenue. 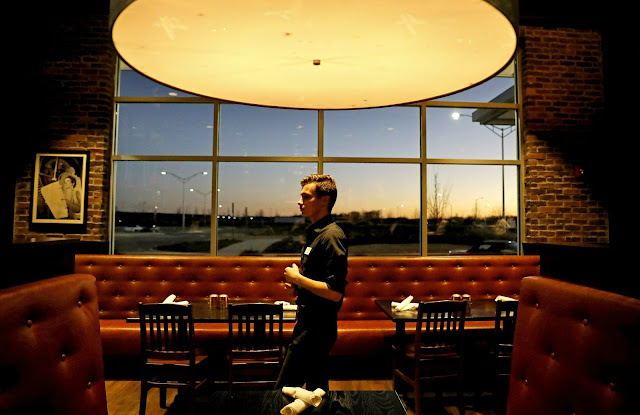 David Moran, director of operations for Clyde’s, the restaurant chain in Washington, worries what will happen if the shutdown extends into February, when events like Valentine’s Day typically give a boost to business. “My fear is that it is getting worse, because people are getting panicky,” he said.